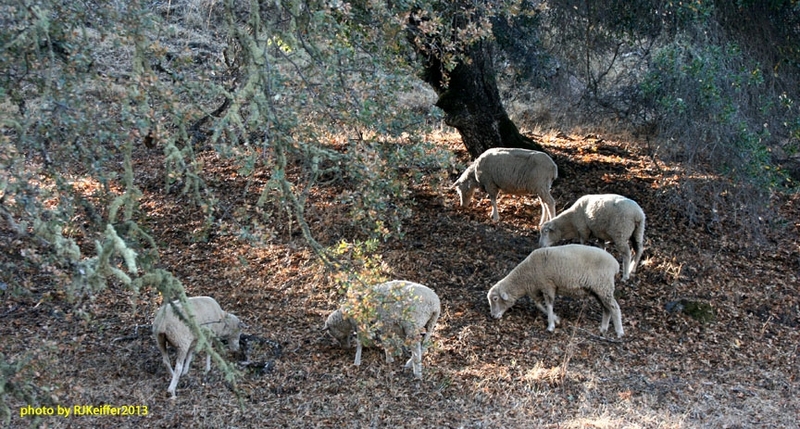 The range flock of sheep at the UC Hopland Research & Extension Center place a lot of energy during this time of year running from oak tree to oak tree. What they are checking for is a dropped acorn from the tree on which to munch on. Acorns during the fall of the year provide an important food value to both livestock and black-tailed deer (and many other wildlife species) in the North Coast, as they contain high carbohydrate and solid fat compositions. In 1983, Michael E Fry from UC Berkeley investigated the importance of this acorn production as part of his M.S. Thesis ...titled Acorn prodcution and the value of oak frage to wildlife and livestock in California. For two years Fry monitored black oaks, interior live oaks, and blue oaks for the prodcution of acorns and litter (leaves, twigs and lichens). Fry found that during a good "mast" (nuts and/or berries that accumulate on the forest floor) year, blue oak, interior live oak, and black oak respectively produced 2955, 1074, and 616 kg/ha of tree canopy. As part of Fry's work, yearling lambs were fed 0%, 10%, 20%, and 30% of their diet as acorns in a 41-day feeding trial. The zero-level group lost 0.86 lb. of body weight per week while the sheep in the 30% acorn supplement group gained an average of 0.32 lb/week.